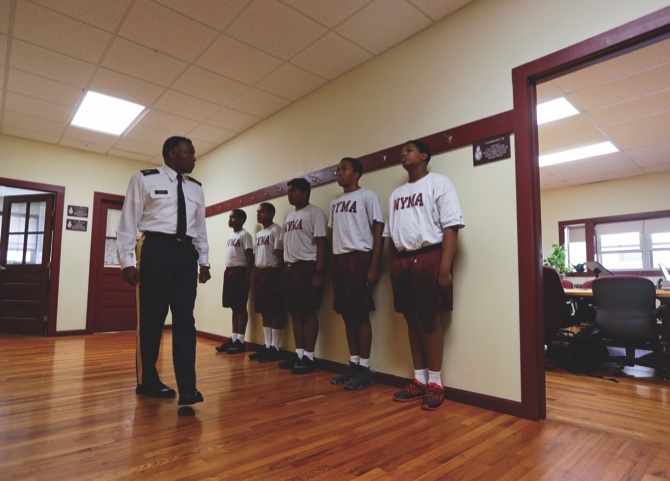 Cadets line up before lunch at the New York Military Academy in Cornwall-on-Hudson, N.Y. While Donald Trump talks tough about dealing with China, his old military prep school is building bridges to that country. The New York Military Academy began classes this fall with new Chinese backing and a former New York City high school principal, originally from China, in charge. Students here still march and study like when a teenage Trump donned a buttoned tunic and sash in the early ’60s. But administrators trying to renew the 127-year-­old school also are looking hard at the growing number of students coming from overseas. “We’re in a position of rebuilding,” said the new superintendent, Jie Zhang. The academy is a picturesque but partially timeworn boarding and day school hosting students in grades seven through 12 on a campus of 120 rolling acres near the Hudson River. 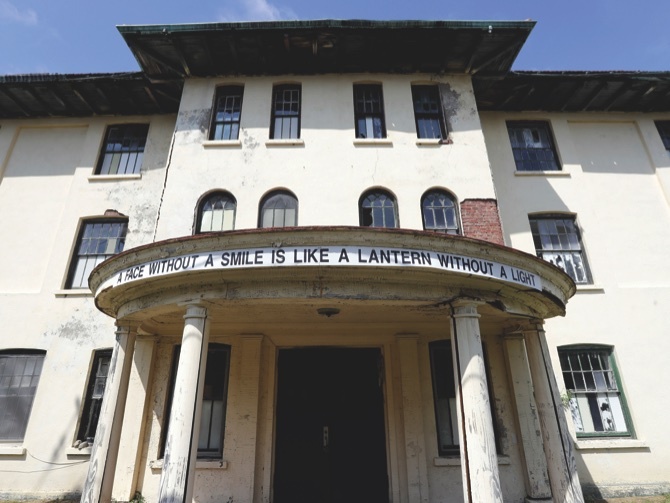 Founded in 1889 by a Civil War veteran, the school used to teach hundreds of students at a time at its campus 60 miles north of New York City. Last year, that number dwindled to 10. The school was purchased at a bankruptcy auction last September for USD15.8 million by the nonprofit Research Center on Natural Conservation. The center was formed by the family of the chairman of SouFun Holdings, a real estate internet portal in China, and in 2011 bought a nearby Gilded Age estate nearby once owned by the railroad magnate E.H. Harriman. SouFun’s chairman, Vincent Tianquan Mo, noted that he studied in both China and at Indiana University and saw the purchase of the military academy as a way to give back to education. The academy has 31 students this fall, still short of the 100 needed to avoid a deficit. Classrooms and barracks around the main grassy rectangle are kept up, but some outer buildings need care, and weeds sprout from the unused tennis courts. This school taught composer and lyricist Stephen Sondheim and film director Francis Ford Coppola, though Trump is easily the alum most in the news since his presidential run. He played baseball and was noted as a “ladies’ man” in his yearbook. During an April visit — his helicopter landed here before a political rally across the river — Trump stood at a podium and said he learned about toughness and the military here, according to a YouTube video. “It was five of my better years in life. I don’t know if it was my best. It was good,” Trump jokes in the video. 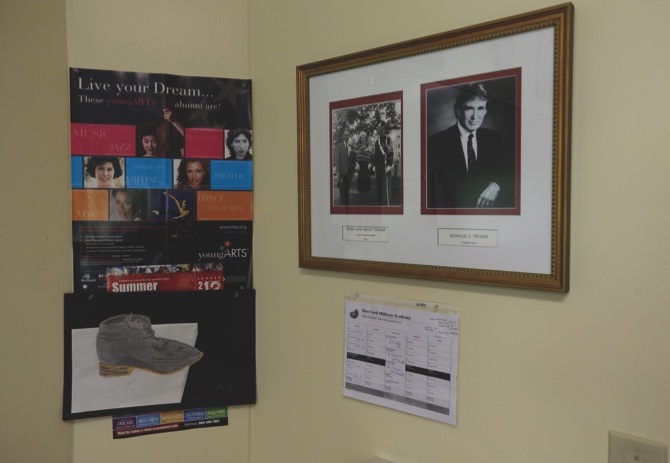 Trump’s headshot now hangs on a wall of the main building among a long row of notable alumni. Zhang said that she is mindful of tradition here and that recruiting local and U.S. students, who will continue to make up the majority of the students, is more important than looking overseas. She plans to continue the long-running junior ROTC program. But Zhang’s mere presence represents a break from the past. The 56-year-old educator is the first woman and the first Asian to lead the academy. She came to the United States in 1985 from Shanghai to earn a master’s degree in applied math and began a long public school career teaching female inmates at the New York City jail complex on Rikers Island. She retired this year as principal at the city’s prestigious Stuyvesant High School. “I am Chinese, but my whole entire career has been in the United States,” she said. While the academy has hosted international students for decades, Zhang could help it compete in a time of quick economic growth in China and other countries. The number of students attending U.S. private and independent schools on academic visas more than tripled between 2005 and 2015 to 94,766, according to the National Association of Independent Schools, which represents nonprofit, private K-12 schools, including the New York Military Academy. China sent over more students on academic visas than any other country over that time among schools belonging to the association, from 348 in 2005 to 14,579 last year. “I think that families abroad feel that having facility with English will get their children ahead in life, whether it’s in college admissions or in the professional realm, ” according to the association’s Myra McGovern. The seven students here with Chinese backgrounds include two on student visas. As they seek more international students, Zhang will go to Beijing and Shanghai in October on a recruiting trip, and her dean plans to go to Moscow in the spring. Thirteen-year-old cadet Charlie Dong emigrated from Shanghai four years ago and lives with his family in New York City. He wants to go to West Point, which is near here, and he hopes the academy gives him a better chance.